Okay, college graduates, if you could continue dormitory-type living even after leaving school, would you opt to do so? If your answer is “yes,” then you may be pleased to see this option developing in certain cities. I thought my college years were behind me. But I’m seriously reconsidering the dorm life since visiting Manhattan’s first-ever location of communal living startup WeLive. Of course, the concept of communal housing isn’t novel. . . . But this isn’t your typical dorm situation: You have your own apartment but get access to a chef’s kitchen, yoga studio, conference room, laundry/arcade room, and neighbors who actually want to talk to you. The layouts in WeLive’s 400 units range from small studios to four-bedrooms, and all apartments come fully furnished. Per-tenant pricing begins at $1,375 but if you want a bit more privacy, you’ll have to dole out at least $2,000 per month. The most common setup is the “studio plus,” which comes with two beds (one is a Murphy hidden in the wall); these range from $2,500 to $2,800. A flat monthly utilities payment of $125 covers electric, water, cable, wifi and cleaning costs (yes, housekeeping is included). WeLive is a new way of living built upon community, flexibility, and a fundamental belief that we are only as good as the people we surround ourselves with. We know life is better when we are part of a community that believes in something larger than itself. From mailrooms and laundry rooms that double as bars and event spaces to communal kitchens, roof decks, and hot tubs, WeLive challenges traditional apartment living through physical spaces that foster meaningful relationships. Whether for a day, a week, a month, or a year, by joining WeLive – you’ll be psyched to be alive. If you’ve read this blog for any length of time, then you know that I’m fond of sharing nostalgic moments from my college and law school years. I can even get a little soggy over memories of dorm life. At Valparaiso University in northwest Indiana, my undergraduate alma mater, I lived in dormitories, with the exception of a final semester spent in a study abroad program. At New York University in Manhattan, my legal alma mater, I lived in law school residence halls throughout my stay there. When I graduated from NYU Law, bound and determined to save the world as a Legal Aid lawyer (and with a $20,000 salary to remind me of my lofty idealism), my Manhattan housing options were practically non-existent. Consequently, I followed the trail blazed by other young denizens of the city’s non-profit sector and crossed the bridge into Brooklyn for a relatively cheap apartment share and a long subway ride to work. My first place was a three-bedroom apartment share. I believe the total rent, split three ways, was $1,000. Those affordable Park Slope apartment shares are no more. The brownstone rentals so popular among my fellow Legal Aid colleagues and others similarly situated are now homes commanding high six and even seven figures in the current real estate market. And so comes the market opportunity for WeLive. With more bohemian living options no longer available in places like New York, WeLive steps into the void and offers young, hip, and conveniently located housing options aimed at Millennials. Measured against the cost of living standards of almost any other area, WeLive is still pretty expensive. But to find a comparable rental in New York, your daily commute might start to resemble a sojourn. When I moved to New York in the 1980s, gentrification and higher living costs were very much a part of the civic dialogue. Today, however, the housing costs are mind boggling. New York is not alone in this reality, at least among high demand urban places. This is definitely the case here in Boston. It’s why ventures like WeLive are getting attention. 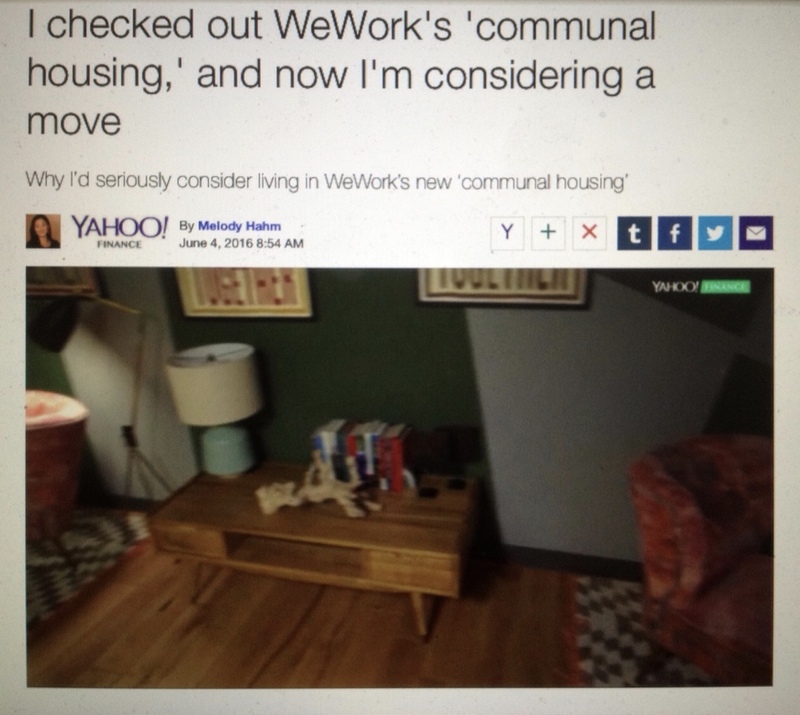 In reality they are expensive versions of what 50 or 75 years ago would’ve been called boarding houses, with a dose of social selectiveness built into the marketing: WeLive is a new way of living built upon community, flexibility, and a fundamental belief that we are only as good as the people we surround ourselves with. Personally, I’d rather have affordable apartment shares in Brooklyn, but I realize that time has passed.